Isaac was clearly struggling. Imagine the terror this poor cat was feeling: trapped in the middle of a busy Chicago street — turning in every direction, only to be confronted with another car rushing past. Isaac didn’t know how to get to safety. It was only a matter of time before Isaac would be hit by a passing car and severely injured or killed. Remarkably, several Good Samaritans saw that he was struggling and stopped their cars in the street, surrounding Isaac to protect him from oncoming traffic. One driver jumped out of her car and pulled him to safety. Immediately, she could tell Isaac was suffering and called Tree House for help! When Isaac arrived at Tree House, he needed urgent care. During his initial veterinary examination, our clinic team discovered that Isaac had severe and painful infections in both ears and very limited vision — both of which contributed to his disorientation. 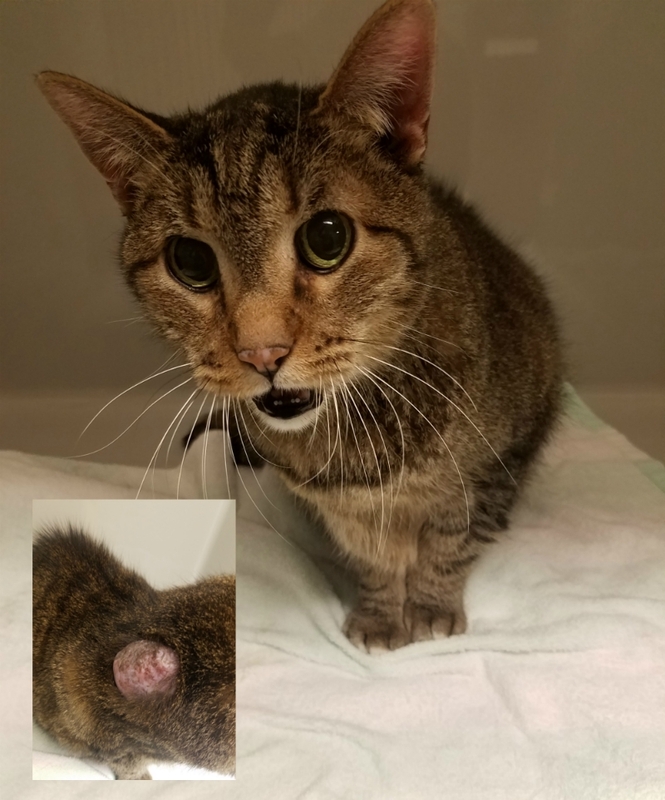 He was also missing 13 teeth and suffering from dental disease, which is not uncommon for cats who are malnourished from living on the streets. In addition to treating his ear infections and extracting several infected teeth, we biopsied his tumor. When Isaac arrived, his first and most noticeable condition was a large raw tumor bulging on his right shoulder. Tests revealed his tumor was cancerous. But this beautiful cat’s good fortune continued — the type of cancer he had rarely spreads or recurs. We removed the tumor and his prognosis is very good! We placed Isaac with one of our foster parents so he could rest and recover and have the security of a warm bed, food, and water along with the love that he so desperately needed. Isaac has healed incredibly well both physically and emotionally. He is a bit camera shy but a sweet and affectionate cat who turned out to be a real snuggler. He loves taking naps on a comfy lap. 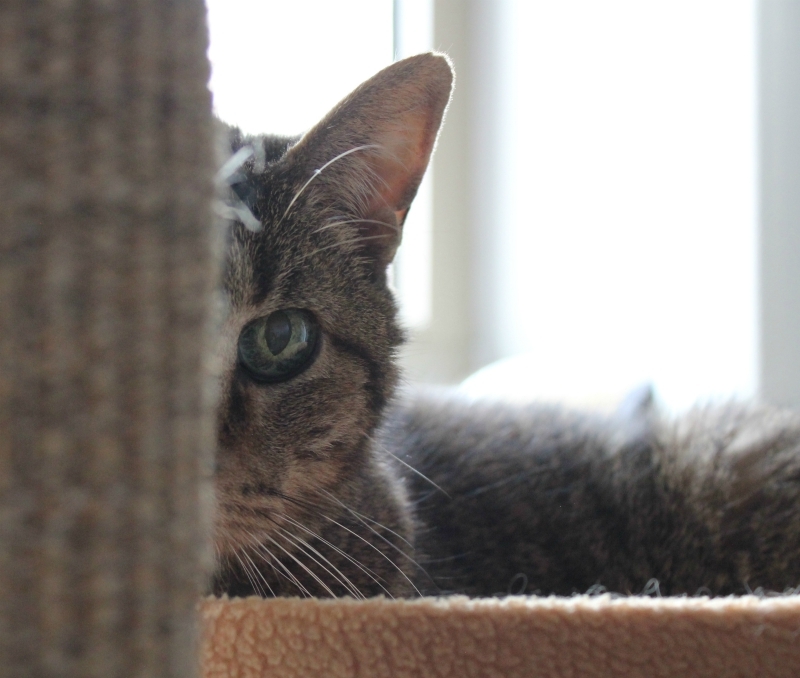 Despite being a senior cat with limited vision, Isaac is an active boy who enjoys playtime. Thanks to people like you, Isaac is safe at Tree House and ready to be adopted. We hope this deserving cat will not have to wait long for his new home! Please share Isaac’s story to help him find a loving home. There are thousands of cats just like Isaac living outside in Chicago – many of whom are struggling. We believe every cat deserves to live a safe and healthy life. Your Donation Helps Give Them a Fighting Chance! Enter your email address to subscribe to this blog and hear all about cats every Friday! Kitten Conundrum: Where Do They Go Until They’re Ready? #ThanksToMaddie, We Can Save More Kittens! Volunteers Wanted: Clinic, Pet Food Pantry, and TNR! National Kitten Coalition Visits Tree House – Join Us! Neuter is Cuter! Hurray for Spay!